Mentor and guide to the Lost Generation of expatriate American writers, including Hemingway and Fitzgerald, Gertrude Stein (1874-1946) is perhaps better known for her Parisian salon than her literary works. Yet her innovative approach to writing and her originality of thought make the impact of her books on contemporary literature enormous. Tender Buttons, published in 1914, is vintage Stein. She pushes abstraction to its farthest limits by experimenting with words purely as words in a style more akin to painting than literature. Interested in their melody and color, Stein favors verbs and prepositions in unusual combinations and attempts to avoid using nouns. According to Sherwood Anderson, Tender Buttons "gives words an oddly new intimate flavor and at the same time makes familiar words seem almost like strangers ... For me the work of Gertrude Stein consists in a rebuilding, an entire new recasting of life, in the city of words." 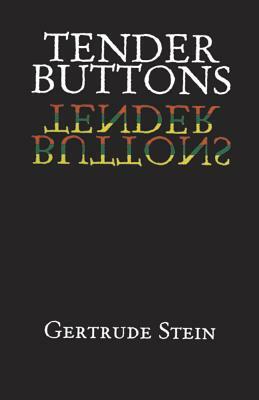 Often compared with music and Cubist imagery, the exhilarating prose and thought-provoking experimental techniques of Tender Buttons offer readers a rewarding sojourn through one of Stein's most influential works.